Add this listing to your favorites and always check it before you go shopping!!! I Am Challenged To Get To A More Organized and Expert Couponer Level Are You?!? I love following different blogs, they can lead you to so many really neat blogs that can teach us so much. Check out Moms By Heart...She has posted a great blog instructional on how to start a coupon 'wishlist' and 'havelist' at Hot Coupon World, so that you can get to a more extreme level of couponing!!! I am intrigued and challenged. There are so many great coupons out and about right now, I wish I lived in a urban setting, closer to stores, I would be all over this in a heartbeat. I think this will make a great New Year's Eve goal. Your perspective changes when the nearest WalMart is over 25 minutes one way from you...and you shop with a toddler who hates to travel in the car, by the time I drive to the store he is beside himself...I guess I should be asking, how can I turn my toddler son into a 'couponing freak' before he is even potty trained?!? It's amazing how competitive websites are for advertising. If you haven't already signed up at Betty Crocker for their coupons and specials, then now is a great time. They are also offering a really neat and FREE Coupon book with over $10 of coupons and great new recipes for new subscribers to their site. So click away for a really good deal!!! Sign up at Pillsbury and receive a FREE coupon book with over $10 worth of coupons, plus some really neat recipes. In addition, Pillsbury is really good about sending out email notices on special coupons, recipes, etc. Very much worth the sign up to their site. 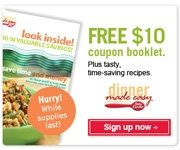 Click away and receive your own copy of a really neat coupon book from Pillsbury.